I bought my first detector at the end of February 2011 which was a whites MXT pro and used it a little bit, but the ground was still frozen and forcing each grain of sand out while digging a target wasnt much fun...BUT spring came along and I got out to detect all the bare spots I could and started finding some coins! 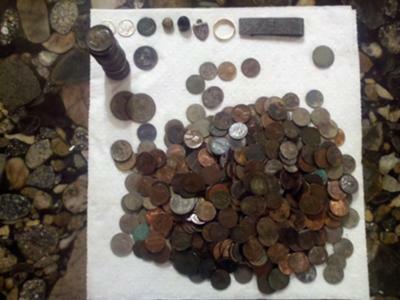 At first I found just clad coins but they were adding up. I then upgraded to the Whites VX3 just recently and boy did that make all the difference! I found a couple mercury dimes *1924, 1942* silver quarters, and a couple rings right away. My job has me working in Pennsylvania for 2 weeks at a time, but then I'm off for a week to go where ever I choose, which is great for detecting. Just a couple weeks ago I found my first pre 1900 coin in a park. It was an 1896 Indian Head Penny, and about a week later I found an 1885 Indian Head Penny while in Michigan. I am a scuba diver, and having read many treasure hunting books, I learned that alot of the jewelry is found in knee deep to chest deep water, which encouraged me to buy a detector for in the water. I recently got the Garrett Sea Hunter 2 which is awesome! I found 2 rings in 2 days. One was an old sterling silver womans ring with a big cubic zirconia, and the other was a man's tungsten ring. 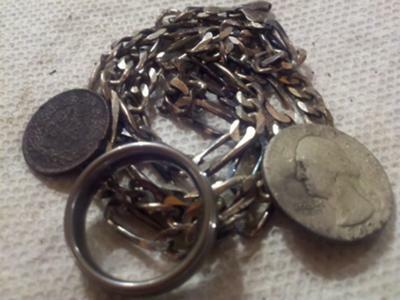 Also found in the same swimming area was a man's sterling silver chain necklace and maybe $15 of coins, one of which is a 1942 quarter. This is an area that I dont think anyone has ever metal detected, or scuba dived in! Its amazing to hit an untouched spot, and be able to pull up good target after good target. You just never know what you will find next! I have met some great people while detecting, and made some great contacts as well. Being young *27* Single and no kids allows me to treasure hunt where ever the road takes me, so it's very exciting! Comments for The treasure is in the Hunt! Dustin, I can remember when I was your age. 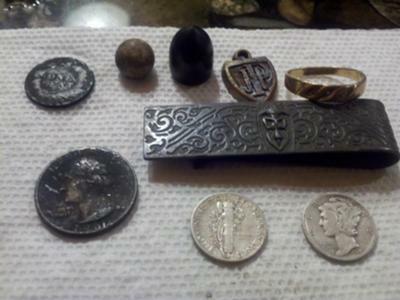 By that time I had been metal detecting about 5 years. I can remember what it felt like back then when finding "stuff." And fortunately, for many of us, that excitement never goes away. If you keep trying new places, and learn the history regarding those areas, and the history behind your finds, you'll soon recognize that your life has taken on an entirely new meaning. Yes, the treasure is in the hunt. Never become so caught up in wanting to just find the goodies. Learn to enjoy the adventure of searching out new places. In that way, you'll always be excited, whether you find something or not.